Executive Chef for the Hotel Valley Ho, Charles Wiley enjoys a career that spans more than 35 years, during which Wiley has earned national acclaim for his innovative cuisine and natural presentations. His signature cooking style takes advantage of local, seasonal ingredients, and time-honored flavor marriages; dishes which tend to be light, yet intensely flavored and robust. Wiley is responsible for the day-to-day development and operation of dining venues, which include the hotel’s signature restaurant, ZuZu. 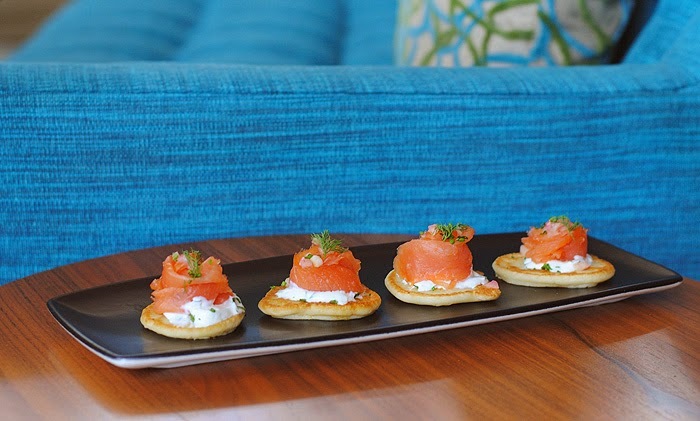 On Sunday's Chef Wiley and his family enjoy making Potato Pancakes with Smoked Salmon & Dill Crème Fraiche. These bite sizes treats are full of flavor and perfect for game day since they can be made in advance and can stay at room temperature. Chef recommends adding a few drops of vodka to the sauce to give it a nice bite, but agrees it's just as good without. Combine the red onion and vinegar in a small mixing bowl. Allow to macerate for about 30 minutes or so until the onions take on a bright red color. Spread a tablespoon of the dill crème fraiche over each pancake. Arrange the smoked salmon on top of the cream. Top the salmon with some of the pickled red onion and sprinkle with chives. In a medium-size mixing bowl, whisk together the flour, baking powder, egg, yogurt, lemon, salt and pepper; set aside. Pre-heat a large electric griddle to 350 degrees; spread out the oil over the surface of the grill. Scoop out about 1/4 cup of the potato mixture and form into a flat pancake about 4” wide. Repeat, making 8 pancakes. Cook until golden brown, 6-8 minutes per side. Whisk together all ingredients in a glass or stainless steel bowl. Refrigerate until ready to use. I make a version of this and people go nuts for it! I also use cucumber slices. We made a version of these in December and they were gobbled up in an instant. Now I have a craving for smoked salmon! Looks great! My husband would absolutely love these. Theresa these potato pancakes are so elegant and versatile for toppings. Pinning and a must-make! Seriously - I'd eat that entire tray and fight anyone who tried to eat one too! Yum! Thank you for sharing! I could make a meal of these beauties! These look like they could be pretty good though I'd probably eat the whole tray. Love the sound of this, love smoked salmon and fraiche! Oh YUM! Love this idea! I love potato pancakes, yum. I have so wanted to try something like this. We have salmon a lot but haven't tried this. Love the idea of adding a dash of vodka to the sauce!